Gulf Construction was on hand as Daimler Trucks showcased new innovations at a trade fair in Hanover, while Mercedes-Benz’s heavy-duty trucks took to the track in southwest Germany. Daimler Trucks showcased more than 60 products, from construction vehicles to smart urban transport and distribution trucks, at the recent IAA International Motor Show for Commercial Vehicles 2016 in Hanover, Germany. The company is upbeat about the Middle East despite an economic slowdown globally. The company made the pivotal decision last year to be closer to its Middle East and North African (Mena) customers, opening a regional centre in Jebel Ali Free Zone, Dubai, in October 2015. Daimler Commercial Vehicles (DCV) Mena supports activities in 19 countries from Dubai, managing the group’s full portfolio of commercial vehicles, including heavy-duty Mercedes-Benz trucks (including models suited for construction and transportation) and Mitsubishi Fuso vehicles (including models suited to light construction activities), as well as sales and after-sales functions. In addition to a network of regional distributors, DCV also has authorised workshops and service centres across the GCC. Some 500 km away from the bustling halls of the IAA, the might of the company’s construction vehicles came into their own. On a test site at Oetigheim in southwest Germany, close to Mercedes-Benz’s advanced automotive engineering plant at Gaggenau where power units for heavyweight trucks are manufactured, Gulf Construction witnessed first-hand the muscle of the Zetros and Unimog high-performance construction vehicle models as they were put through their paces on steep inclines and in the harshest of terrain. Both models handled the gruelling runs admirably, demonstrating the superior off-road capabilities, raw power, durability and engineering excellence for which Mercedes-Benz trucks have long been known. The Zetros stands out with its ruggedness, practicality and impressive design, providing extreme off-road capabilities, outstanding traction and supreme mobility and superior driving comfort in difficult terrain and harsh climates, according to the company. Offering models with a GVW (gross vehicle weight) range of between 19 and 40 tonnes and 326 to 428 hp, the Zetros models are designed for applications including semitrailers, flatbed, tipper, tanker and fire-fighting. A hallmark of the Zetros is its design as a ‘cab-behind-engine’ truck. The truck sports robust planetary hub reduction axles with high ground clearance and single or twin tyres, up to four differential locks, and a two-stage transfer case, providing the foundation for what Mercedes-Benz describes as ‘outstanding capabilities’ in off-road terrain. The Unimog, meanwhile, demonstrated supreme command of the terrain at Oetigheim, venturing where even four-wheeled trucks are unable to venture, effortlessly hauling heavy loads up and down 70 per cent inclines. In addition to the Zetros and Unimog, Mercedes-Benz offers the Actros, Accelo, Atego and Axor range of trucks for construction applications in the Middle East. Daimler marked a significant milestone in September this year when it sold its 100,000th Actros, the company’s global best-selling heavy-duty truck, in the Mena region. Saudi Arabia (44,000 units sold since 1997) is the leading regional market for Daimler, which has a long relationship with its agent Juffali Industrial Products Company (Jipco). 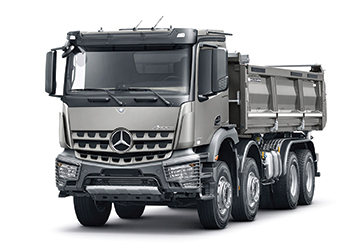 The Actros is suited for sand, gravel and rock tipping operations with high load capacity, several powered axles (six by four) and extra protection features for harsh off-road conditions; mixers (with a variety of chassis versions with two-, three- or four-axle configurations); super heavy-duty transport applications; concrete pump mounts; and silo, semitrailer and flatbed crane applications. Judging by its performance, Mercedes-Benz appears to be justifying its promise to offer ‘trucks you can trust’ in the construction vehicles segment, under the broader Daimler strategy of ‘shaping the future of mobility’.